No one could believe that today was the last full day of our trip; it seems as though not even a week has passed since we all arrived in Montreal. For our last day, we wanted to do something especially fun and exciting — but where would we go? 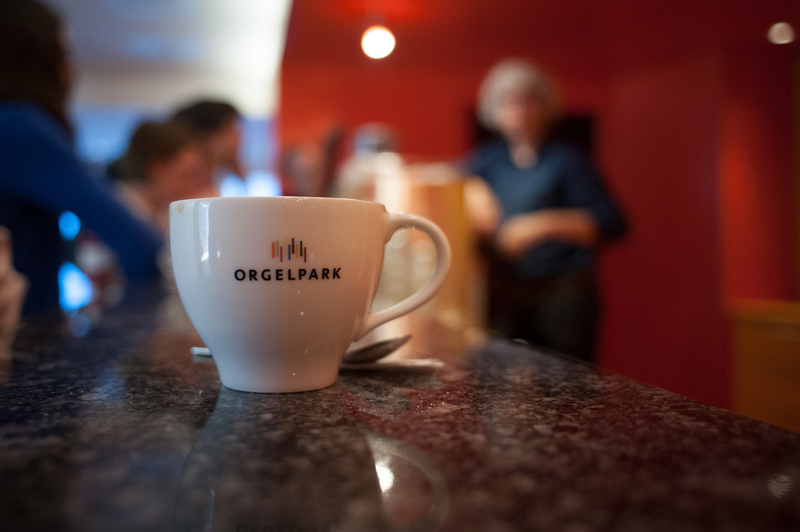 How about the “Orgelpark?” That’s right, a theme park for the organ. I’ll admit, none of us knew exactly what to expect, not even Chris who had only heard of the venue from a friend. 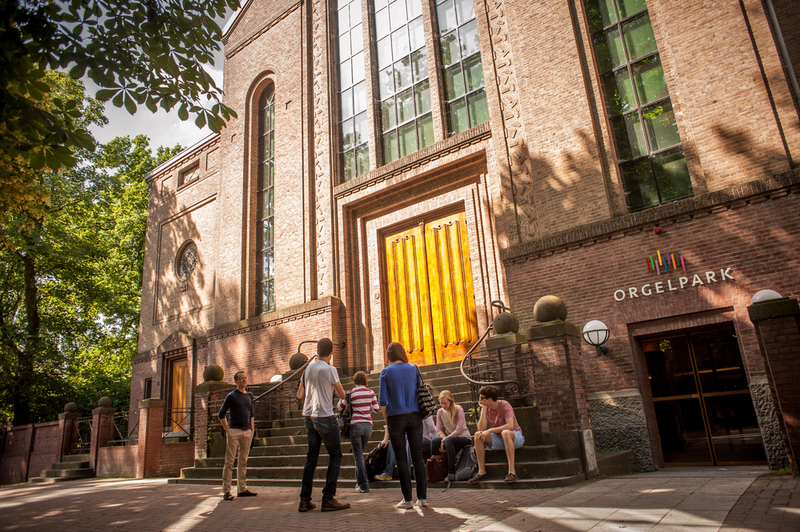 We took a brief walk from our apartment through the Vondelpark (think Amsterdam’s version of NYC’s Central Park) and found ourselves standing in front of plain brick church building. A smorgasbord of organs under one roof! Under the colorful “Orgelpark” sign we met curator and researcher Hans Fidom who welcomed us in to the bright red foyer café for some coffee and tea. 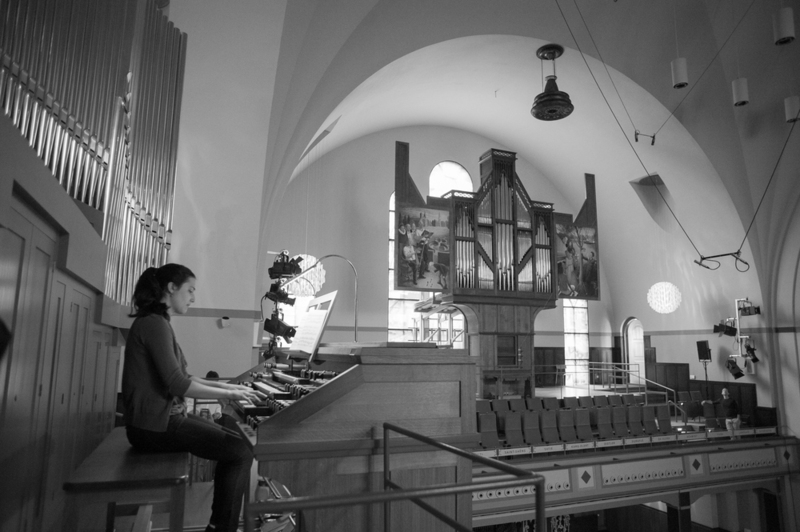 We then moved upstairs into a whimsically colored auditorium where we were surrounded by a smorgasbord of organs and a wrap-around balcony engraved with names of organ composers. The auditorium used to be a church sanctuary from 1918, but today it houses eight separate instruments: a 1913 Mustel Harmonium, a 1925 Molzer parlor organ, a tiny Elbertse-positive organ, a 41-stop reproduction of a Cavaillé-Coll, a Sauer organ retrofitted with a computer-controlled console, a replica of a 15thCentury medieval organ, a Van Leeuwen baroque organ, and a mechanical café dance organ. 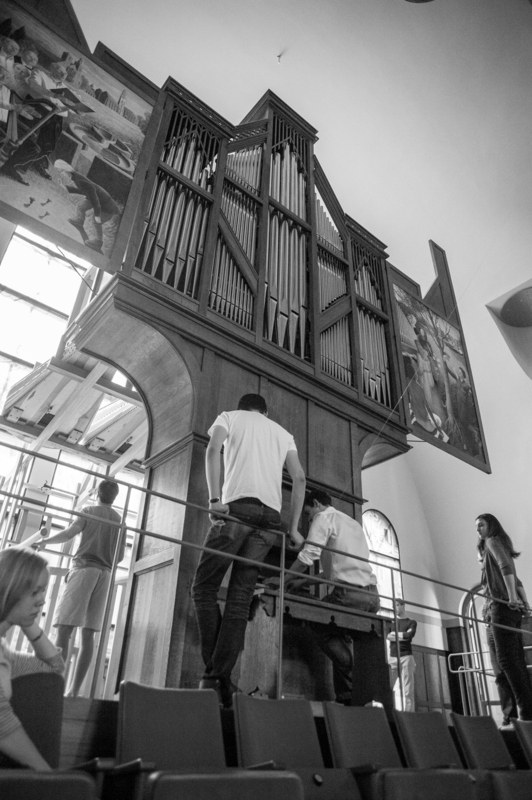 Hans explained that the Orgelpark opened in 2007 and was designed to be both a concert venue (hosting up to 3 concerts a week during season) and a musicology institute. Most patrons are actually non-organists, but rather artists involved in dance, theater, and other experimental music disciplines. There was something both charming and zany about the whole operation, making me feel a little as if I had entered into a pipe organ version of “Willy Wonka’s Chocolate Factory.” Yet, at the same time, our visit to Orgelpark provided a fascinating and perhaps even provocative glimpse into the organ’s potential to become relevant in today’s modern context. We spent the rest of our afternoon exploring the city at our own pace. Some went sheet music shopping; other visited the Anne Frank Museum. Noel and I went hunting for a bakery, determined to find the best stroopwafel in the city. “Stroop-what?” For those unfamiliar with this delicacy, imagine a sweet honey syrup paste sandwiched between two thin waffle crackers. Stroopwafels are very popular in the Netherlands and we’ve seen them incorporated into all sorts of desserts. Last night, we even tried a stroopwafel-flavored liquor! As the sun began to set, we all started making our way towards St. Nicholas’s Basilica in the Old Centre district for the part of the day we had all been waiting for. Meeting up at the water’s edge, we anxiously waited for the arrival of the charter boat we had scheduled for our last evening together. 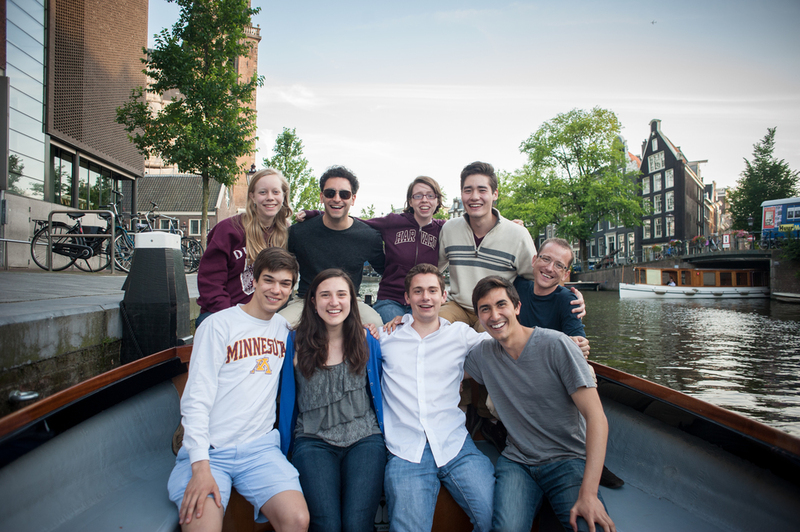 That’s right–the Harvard Organ Society does it all, boat cruises included! Our skipper, Paul, pulled up and welcomed us aboard. 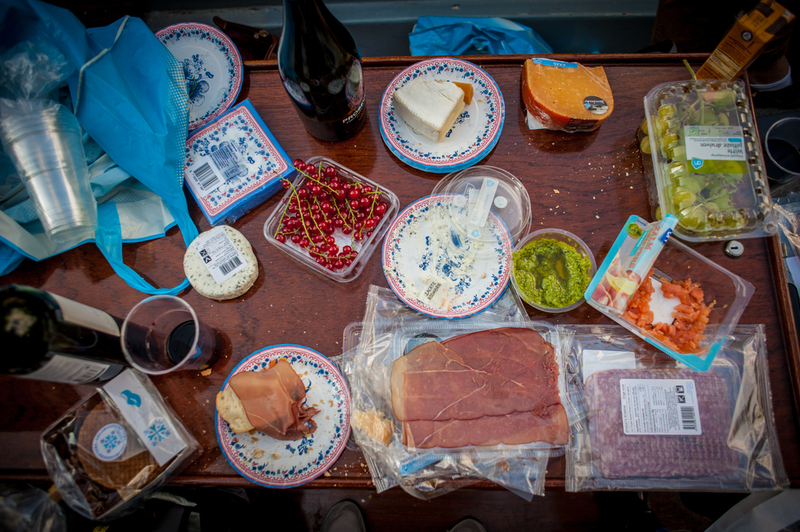 He seemed impressed as we unpacked our bags, transforming the boat’s center table into a full blown feast of bread, cheeses, charcuterie, wine,td and other treats. 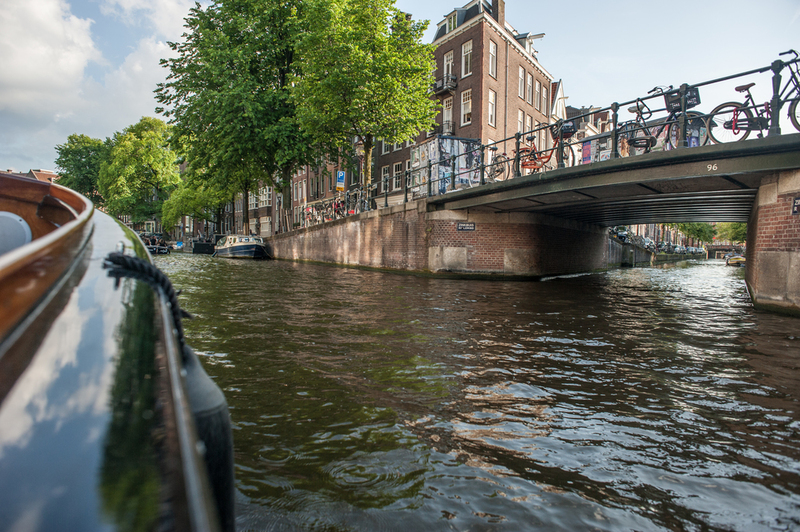 We cast off and soon found ourselves drifting gently down the picturesque canals of the city. 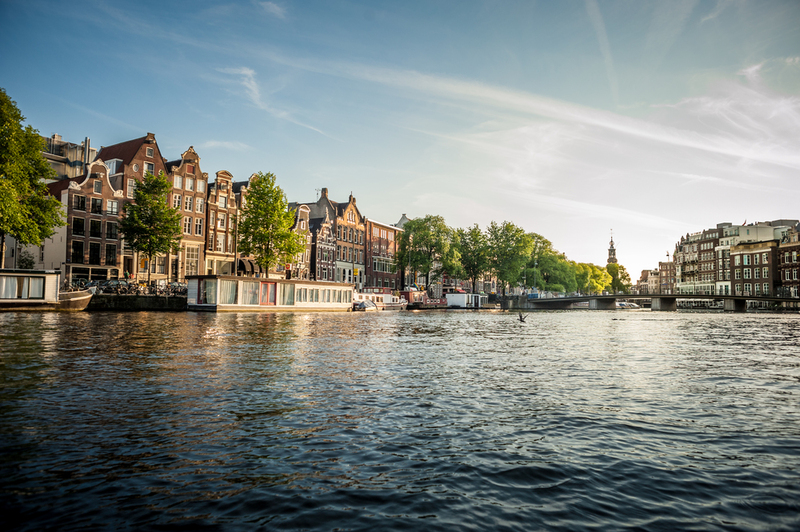 One thing we noticed about Amsterdam is how hectic walking from place to place can be. Between the congested sidewalks, erratic bikers, and whizzing trams, it’s hard to believe we didn’t lose anyone in our group to a madcap moped this week! The perspective of the city from the water, however, couldn’t be more different. Time slowed as we adjusted to the leisure pace of canal traffic, passing under quaint bridges and catching glimpses of scenic vistas through the archways. I felt as if I had entered the scene of painting—it was almost too perfect. Our skipper dropped us off in the middle of town where we had planned on meeting up with former Harvard musicology professor Olaf Post, who was Chris’s colleague and Noel’s former teacher. After a light dinner and some drinks, we headed back home where we enjoyed our last night together in the apartment living room, reminiscing over highlights of our trip. Someone asked, “So when’s the next time we’ll all be together in the same place?” “Never, statistically!” Olaf interjected. We all laughed at first and then sighed because we knew he was probably right. Despite how bittersweet our evening was, there’s really no place for sulking—after all, we just had the most incredible two weeks anyone could ask for. The strange thing about this study trip is that I’m honestly excited to be going home. Several of us mentioned how eager we are to get back on the bench and make music after the rush of inspiration from these past two weeks. In the spirit of Hemingway, Paris (or Europe, for that matter), is indeed a moveable feast—I’ve never so strongly felt that I’ve come away from a single experience with something so tangible as the artistic insight and cultural enrichment we’ve acquired over the course of this amazing journey.